When it was Werner Reich’s turn to take the skein of white yarn, wrap some around his hand and share something thoughtful, he made a confession. Reich, a Holocaust survivor, is part of a new program called UJA Project Witness that paired 24 teenagers from Long Island with eight Holocaust survivors. 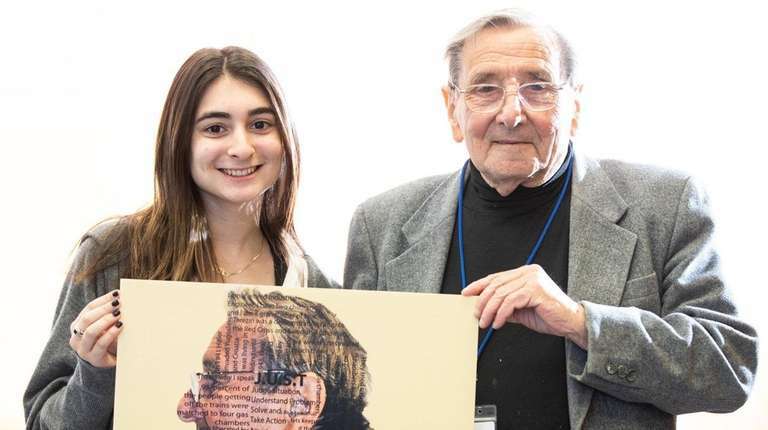 They met every other Thursday at the Sid Jacobson Jewish Community Center in Greenvale during the school year; the older generation was asked to share its memories and the younger one to create artwork based on what resonated with them. Project Witness is a new companion program to Witness Theater, through which 13 high school students worked with five survivors to create a stage performance that explores the survivors’ experiences with war, loss and trauma. Holocaust survivors narrate their stories while the students portray them on stage. That program started in Israel. Six years ago, UJA-Federation of New York’s nonprofit partner, Selfhelp Community Services, brought it to New York and then, this year for the first time, to Long Island. “Obviously there’s a big population of survivors in the New York area, including Long Island, so we thought it was important,” said Andrew Belfer, of Upper Brookville, who co-chaired both Witness Theater and Project Witness along with his wife, Karen, and Rita and David Levy of Roslyn. When Witness Theater was announced, 50 teens applied to participate — writing essays about what they thought they would get out of the program — and the resultant demand was so high that some students would have been turned away. Instead, UJA-Federation of New York and the Sid Jacobson JCC collaborated to create the Project Witness art program to accommodate more students. The students’ artwork was displayed to the public during two sold-out Witness Theater performances April 16 and 17 in a 500-seat theater at Adelphi University in Garden City. The teens’ artwork includes collages, photographs, paintings, poetry and digital works. Time is running out for these types of programs. World War II ended 73 years ago. The Holocaust survivors in Project Witness are all in their 80s and 90s. Reich, who was in a concentration camp as a teenager, knows that his is the last generation of Holocaust survivors still alive. Many of them were young children during World War II; some avoided being sent to the Nazis’ concentration camps because their parents arranged for them to hide with non-Jewish families. “We are the last generation that is going to get to hear them,” said Alison Rosenbaum, 17, a junior at Roslyn High School. One of the eight survivors in the program, Ethel Katz of Little Neck, died just weeks ago at the age of 95. “Her passing really underscores the importance of Project Witness and Witness Theater,” Belfer said. For the survivors, the program is therapeutic — and allows them to express the urgency and passion they feel regarding the need to be ever vigilant. And in the immediate term, the program has been healing for the survivors and illuminating for the students, Belfer said. “There’s a bond between the adults and kids,” said Dina Shuster, manager of the Long Island division of UJA-Federation New York. When the skein of yarn was passed to survivor Doris Usherovitz, 89, she expressed her gratitude. Marion Hauser, 80, of East Rockaway, was hidden from the Nazis between the ages of 4 and 6 on a farm outside of Berlin. Her father worked in a shoe repair shop, and a non-Jewish co-worker offered to hide her. ABOUT THE ARTWORK Rosenbaum’s culminating artwork is called “The Wings of Hope.” She included printed copies of newspaper articles from World War II that she stained using saturated tea bags to create a weathered effect. She also burned their edges and then combined them into a collage. INSPIRED BY Ruth Mermelstein, 88, of North Bellmore. “I will never forget, I walked in the first day and Ruth, she was staring at me,” Rosenbaum recalled. “She says to me, ‘You look just like my sister.’ It made me feel a real connection to the program.” Mermelstein and her sister Elisabeth were sent together to camps including Auschwitz and Bergen-Belsen and survived, but Elisabeth later died at age 53. They lost their parents, three other sisters and a brother in the Holocaust. INSPIRED BY Werner Reich. He was in Birkenau and Terezin concentration camps, and was on a death march that ended at the Mauthausen concentration camp in Austria and resulted in him losing several toes from frostbite. “When I was liberated on May 5, 1945, I weighed 64 pounds,” Reich recalled. “I was 17 years old.” He holds a sign that says, “The Good People Did Nothing,” a sentiment that resonated with Jackson. ABOUT THE ARTWORK It incorporates current photographs of the Holocaust survivors who took part in Project Witness and past photos they provided of themselves. The word “remember” is superimposed in capital letters across the 6-foot-long collage. INSPIRED BY Meir and Doris Usherovitz, 91 and 89, respectively, of St. James. Both spouses are Holocaust survivors. Meir was 12 and in Poland when Jews were transferred to ghettos. He was brought to Auschwitz as a teenager and lost his mother, father and two brothers. “I never saw them no more,” he said in accented English. “I was left by myself.” He slides his sleeve up to show the number that was tattooed on his arm when he was in the camp. “Nobody had a name at Auschwitz,” he said. Doris was from Czechoslovakia; she and her mother, father and brother got out of the country and made it to Palestine; her extended family ended up in concentration camps. She and Meir met in Israel.